This course covers a variety of Lean Six Sigma topics such as Six Sigma business drivers, customer value and expectations, process capability, hypothesis testing, and process/product improvement. Specific objectives include: how to determine If Lean Six Sigma or DMAIC is needed for a given project; describe the elements of a Six Sigma project charter; how to conduct process capability studies; describe a hypothesis test for means, variation, and proportions; and how to use F-Test and T-Test to validate solutions. 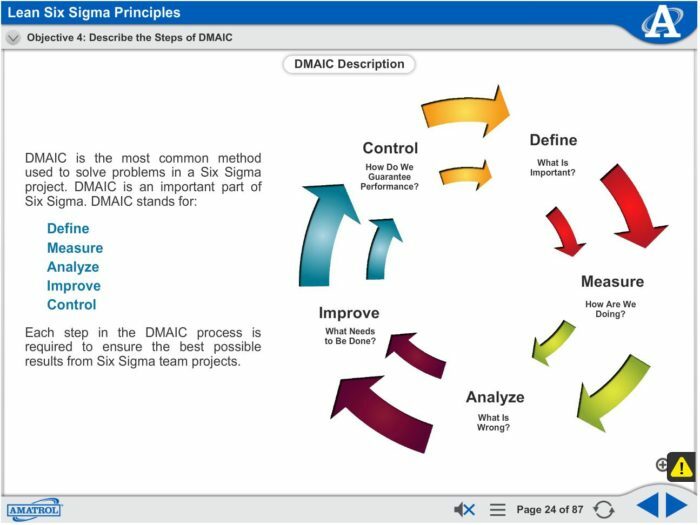 Learners begin with an introduction to Lean Sigma Six, including Six Sigma, Six Sigma business drivers and projects, and processes similar to Six Sigma. Individual lessons focus on topics like the roles and benefits of Lean Six Sigma, steps of DMAIC, basic operation of a business, and balanced scorecards. Lessons eventually advance to more complex topics, such as how to identify and select a project, the Theory of Constraints, design for Six Sigma (DFSS), and identify, design, optimize and verify (IDOV). Learners will study proper project management and customer determination, including launching a project, customer value and expectations, requirement analysis, common metrics, and related management tools. Individual lessons focus on topics like the cost of poor quality (COPQ), elements of a Six Sigma project charter, identifying customer for a product, and defining quality function deployment (QFD). Lessons eventually advance to more complex topics, such as how to use a cause-and-effect matrix to analyze customer needs, primary and consequential metrics, key performance indicator (KPI), and business process management. In this module, learners will use Amatrol’s Six Sigma eLearning course to study team development and management, including team dynamics, Six Sigma teams, and team activity. Individual lessons focus on topics like types of teams, characteristics of a successful team, and positive/negative team member behaviors. Lessons eventually advance to more complex topics, such as the basic structure of Six Sigma team, how to conduct a Six Sigma team meeting, and interpersonal communications techniques. Continuing through the Six Sigma module, learners will be introduced to measurement components, including data collection, normal distribution and probability, measurement system analysis, and process capability. Individual lessons focus on topics like tools used to model a process for Six Sigma project, types of data collected, and guidelines for collecting data. 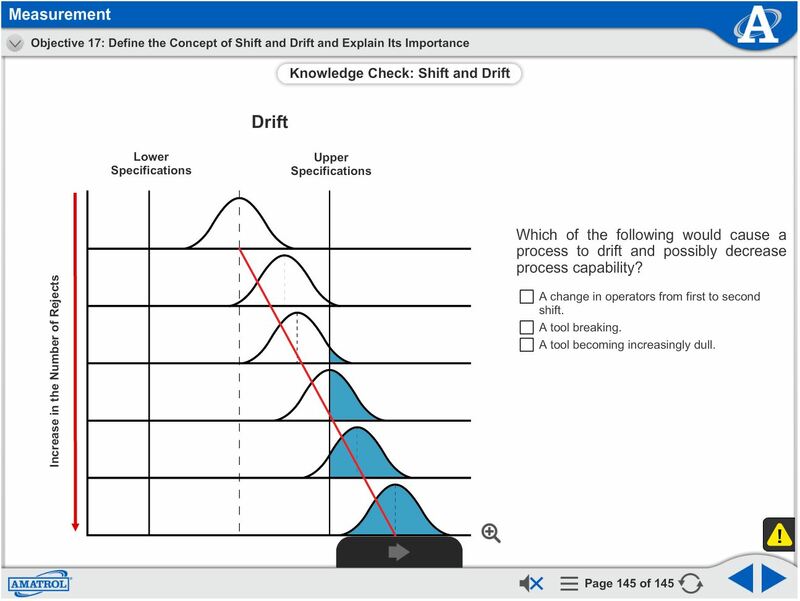 Lessons eventually advance to more complex topics, such as the importance of normal distribution, types of measurement system error, and how to conduct process capability studies. Learners will study proper analysis tools, including multivariate analysis, hypothesis testing, and non-parametric analysis. Individual lessons focus on topics like the analysis phase of a Six Sigma project, regression analysis, and how to use the method of least square to perform a regression analysis. Lessons eventually advance to more complex topics, such as how to determine the statistical significance of a set of data, hypothesis tests for means, variation, and proportions, and how to use a chi-square test to analyze statistical significance. Finally, learners will conclude the module with an in-depth look at improvement and control topics, such as improving a phase of a Six Sigma project, design of experiments, process/product improvement, and control phases of a Six Sigma project. Individual lessons focus on areas of study like goals of the improve phase of a project, primary experimental objectives, and three specialized experimental designs. Lessons eventually advance to more complex topics, such as how to use F-test and T-test to validate solutions, goal and activities of the control phase of a project, and how to close out a Six Sigma project. 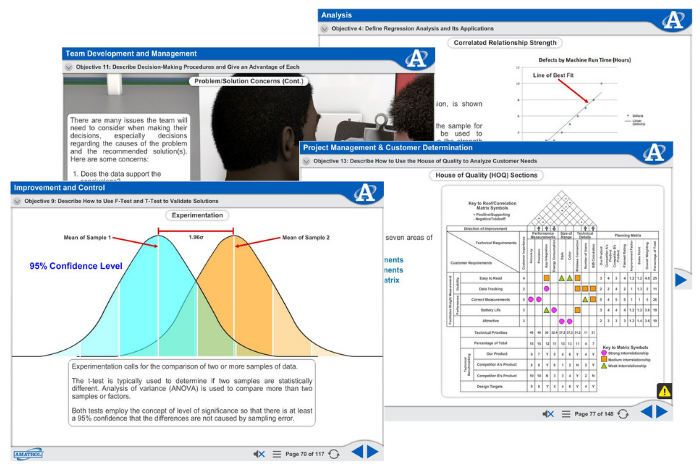 Amatrol’s CNC Mill eLearning course curriculum features a highly-interactive multimedia format. Stunning 3D animations, videos, pictures, voiceovers of all text, and interactive quizzes and exercises bring learning to life. Amatrol’s multimedia curriculum contains elements that will appeal to every learning style, keeping learners motivated and engaged.